NOW is thankful to sit down with local artistic dynamo Clark Rians, hot on the heels of his lauded run of Red at the Corn Stock Theater. 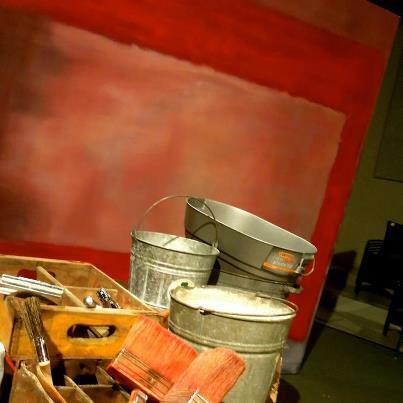 An unforgettable excavation of Rothko’s inward character, the stage play Red depicts his struggle completing a series of paintings for the new Four Seasons restaurant while enduring the blistering honesty of a fictional assistant, Ken. Lead apostle of spiritualized abstract expressionism, Rothko was as notoriously misanthropic as he was talented—no secret to the art world, nor to those close to him. He was a complicated painter with what seemed like a direct link to another state of being—an arresting place of exposed nerves and indeterminate physicality. It takes a body of knowledge and experience across many disciplines to tackle such a volcanic character, and NOW is pleased to interview someone who possesses that necessary depth, local artist Clark Rians. Parker Biederbeck: You just finished Red at the Corn Stock Theater in Peoria, Illinois. What was your first encounter with Red and why did it continue to haunt you? Clark Rians: Victoria and I saw it in New York with Alfred Molina starring and Eddie Redmayne as the young assistant. I have nothing but high regards for both of those guys. The first thing that took me when we walked in to get our seats—Molina was already on stage sitting in his adirondack chair smoking. I thought it was the coolest thing I’d ever seen in theater. P: I was blown away by that too when I saw it. You’re walking into something that’s already happening. C: It really affected me. We had seen hundreds of plays in many different cities, and I had never had that experience. That’s what hooked me at the beginning. The drama that’s present, even without art being a subject in this play, is wonderful. Eddy Redmayne’s Ken really struck both of us as the main character. There was a choice either by Molina or the director, or both, to make Rothko edgy and angry the whole time, which gets monotonous. This was a situation where we thought the choice was kind of odd. Even if it were that way, why do that? This was our main thought coming out of it—”Wow, Eddy Redmayne’s Ken was fascinating. 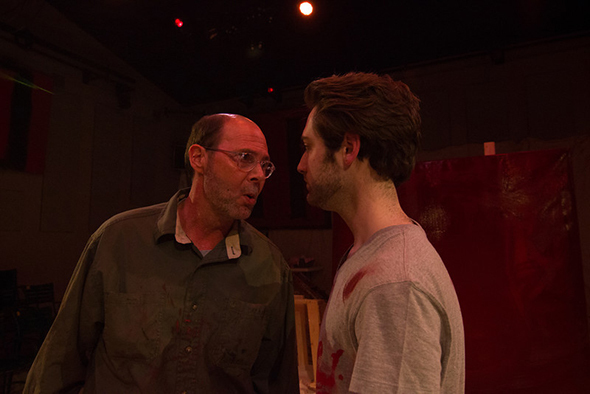 The arc he went through from obsequious to up-in-the-guy’s face, was fascinating.” That turned into a positive for Victoria, in picturing how she would want to do the play differently and imagine Rothko as he was—multi-dimensional. 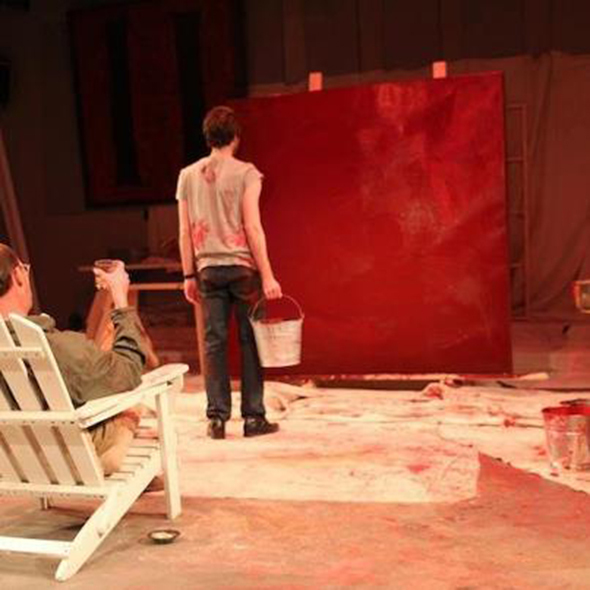 P: Rothko would die a dozen years later after the events of Red. How did that affect your approach to the character? Did you let yourself, as Rothko, “know” that was going to happen? C: I think he contemplated suicide for a long time. I think he was considering it during the play. I made a conscious choice to show that depth that he paid a price for. Ken quotes Hamlet and says, “To be or not to be, that is the question.” My choice was to make that statement hit Rothko like a brick and bring him back to those thoughts, even then, about suicide. He says, “Is that the question?” as if he had been contemplating it. It was an underpinning of his character that he was melancholy. P: He’s got a destiny you’re aware of the whole time, tragic but grand. C: There was a really good article in the Guardian about Rothko and what happened to his paintings. Apparently his paintings that he donated to the Tate Museum, which then moved to the Tate Modern in London, arrived at the Tate the very day he killed himself, in February of 1970. Kind of chilling. P: The pressure got to him, or maybe he couldn’t function as authentically as he needed to. C: He was sick and his marriage was falling apart. Both he and his wife had a drinking problem by then. You could even argue that he died of alcohol. He had an aortic aneurysm in his chest and was supposed to stop smoking and drinking, which he couldn’t do. He obsessed about it, as people who are addicted do. His rock bottom was suicide. He never got help. With his marriage to a woman he really loved, Mel, falling apart, he had moved into his studio. He was really down in the dumps and he just did it. 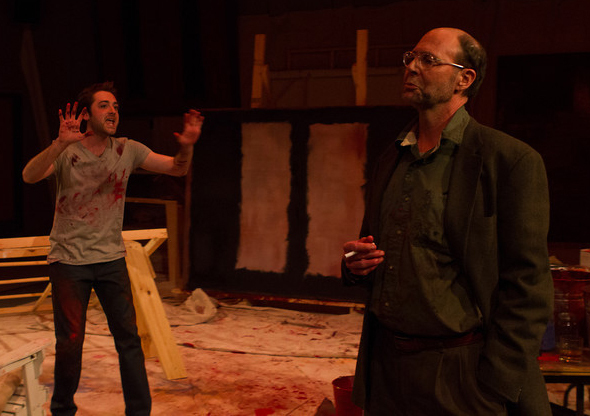 P: Your co-star Andrew was a fantastic foil for the cynicism and mysticism of Rothko. He was something of a hopeful pragmatist. What was it like working with but one other performer? C: It’s delightful working with Andrew. That’s the fourth play that we’ve done together. P: What others have you two been a part of? C: We met at Angels in America Part 2: Perestroika in November of 2011. That whole cast bonded. It’s a bit unusual for a whole cast to bond like that to the point where, one night, someone announced that, “We are going to keep working together!” I’m getting chills just saying that. We ended up next doing A Midsummer Night’s Dream by Shakespeare. These guys will not be denied. They recruited 18 other actors, besides the three of them, and formed the Great Work Begins Theater Troupe to make it happen. Outside at Camp Wokanda, they used the entire space and people loved it. It’s a great venue. C: Oh goodness, yes. They used sloping hills to have characters appear out of nowhere and they came out from the woods. It was neat. We want to continue working together, this is a thing that has legs and life. P: Collaborations between performance and space are very interesting—taking it out of the theater. C: That’s their idea. Bring the play to the people, not make people come to them. They did their second production, The Taming of the Shrew, at Kelleher’s. It was really a good venue because it was upstairs, downstairs, and they used all that. They came out into the audience. They took away the tables and set up chairs in rows, sort of as a proscenium that extended into the audience. P: I loved how Rothko’s paintings were set up to envelop the room. They were kind of like a second audience, silently judgemental and always watching. What was your experience recreating something so otherworldly as those works? C: It guess I didn’t let it bother me, having painted. I tried using a water-based paint that I wasn’t familiar with, and I was throwing eggs into it to make it work. But I just don’t know fresco-type paint. I know oil-based paint after messing with it for years. After one trial of the water-based stuff I went right to oil and kept doing it. It really wasn’t that intimidating because I’m familiar with the material. I just sort of shut my mind off and did it. If something didn’t work I just fixed it. That unconscious process is what I love about doing visual art. Your conscious mind shuts off and something deeper takes over. Something intuitive takes over and makes things happen. You’re not even sure you did it half the time. It just appears. P: Doesn’t it seem sometimes that the submerged self is a lot more intelligent than the aware part of the self? It has access to all your experiences. C: That’s what is so magical about paint. It allows that expression. P: How long have you painted? P: How did you begin? Curiosity? C: I took drawing classes in college. I always had an affinity for art but it was sort of drowned in all the math and science I had to deal with for years and years doing what I do. I got to finally come back to it. It was a painful experience that brought me back to drawing, just to get my mind off it—a breakup of a relationship that was very scarring. So I drew, night after night. Then I discovered this place (Contemporary Art Center of Peoria) and took a class with Preston (Jackson) and started messing around with paint. And I kept doing it. P: Can you tell me about your own painting practice? Things that you’re interested in? C: I sort of let it wander. It’s an area of freedom for me. I’ve done stuff about the Holocaust and the wars–my wife is a military historian, so she’s put me onto a lot of good authors. You can’t help but do some things. I did a portrait of Wilfred Owen after reading his poetry. Things get inside you and want to come back out. After reading a lot of military history I ended up painting a soldier which shows, I think, PTSD in a visual form. This guy’s face sort of cracking up before your eyes on one half, the other half looking more normal. That’s something that a lot of these guys right now, coming back, are experiencing. They’ve seen horrors and other things you’d never see in a normal life. That’s the heavy stuff. I like to do portraits. They’re probably my favorite thing to do. Preston got me doing that. I never would’ve had the courage to try it if not for him. He pushes you right into it. He saw all of us struggling one night and said, “Let me take you right back to the beginning. I’m going to show you how to set one up.” And he started drawing the facial bone structure just like Leonardo would. We just watched him, absolutely captivated by it. It was very helpful. You start with the really basic stuff. You gotta start by knowing where things go. P: As we saw from your work on the production of Red, you’re an actor and a visual artist. You’re also a practicing primary care sports medicine physician. Do you think your interest in the human body’s potential for movement has helped draw you into acting? C: That’s probably true because I’ve studied kinesiology and all that. I really love watching dance. I think ballet is amazing. I revel in that stuff. I almost can’t conceive of what they’re doing, it’s so amazing. They have such power and control, creating beauty in every moment. It’s amazing. P: I’ve seen the battered bodies of ballet dancers. They look like they’ve been playing pro football. C: Yes, and they live in a culture that doesn’t allow them to slow down. Although that is changing. People in all athletics are starting to pay attention to how to keep our bodies going longer. It’s evolving. Especially right now with brain injury in football. They’re changing the rules to combat that. It’s good. P: Have you ever considered how your creative life has affected your profession in sports medicine? C: When I’m talking to people—because I read a fair amount, and do art and do theater—it makes you think about the human condition all the time. You can’t help it. You’re immersed in thinking about it and feeling it. It makes you more sympathetic to people. Also just living for a while, and having various maladies, you identify with people sitting on the opposite side. You’ve been in that position. It helped with diagnosing and treating. It makes you more human to be involved in the arts, more aware of people as human beings, not just “a good case.” I’ve taught my residents, for about thirty years now, to not use that word phrase around me. Maybe it’s interesting to you on an intellectual level, but it’s a god awful nightmare for them. P: What’s next on the horizon for you, Clark? C: We are going to do Red once again in Galesburg. Right after that, Victoria and I are going to participate in a play called The Lion in Winter, which is about Henry II and his formidable wife, Eleanor of Aquitaine, and the scrapping over who would be king after Henry I dies. Richard, Jeffrey, or John? It’s sort of a dramedy. P: Like real political life. C: It’s pretty funny, the way they treat one another. There’s a complex relationship between Henry and Eleanor. Henry has kept Eleanor in prison for ten years at the time of the play, 1183, Christmastime at a castle in Chinon, France. They’re all vying for power, all these people and the current king of France, Phillip. I’m playing Henry and Victoria is playing Eleanor of Aquataine. Henry has a mistress and he tends to dangle her in front of Eleanor to try and get her goat. It doesn’t work of course. Eleanor always has a comeback. 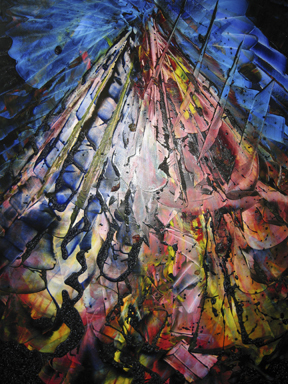 CLICK HERE to see Clark’s artist page at the Contemporary Art Center of Peoria’s webpage.